I’m so excited and thrilled to share this cheesecake recipe on divinetaste. I have spoken before about how overwhelmed we are when we cant savour the tastes of most of those great looking cheesecakes and desserts as they contain a pure vegetarian’s foe, gelatin! I have used Agar Agar, also known as China Grass or Kanten here instead of gelatin and the result has been stupendous! The texture, smooth, silky and marvelous yet having a definitive shape and structure, just like how a good cheesecake ought to be. You had to be there to see me in order to fathom how excited I was when I jumped and shouted with glee just as I gently unlocked my springform pan and this beautiful cheesecake, a cheesecake which had form was revealed. Project mango cheesecake is a success! Yay! Now I know how to make perfect cheesecakes without gelatin. Three cheers to that! I loved the crust too. 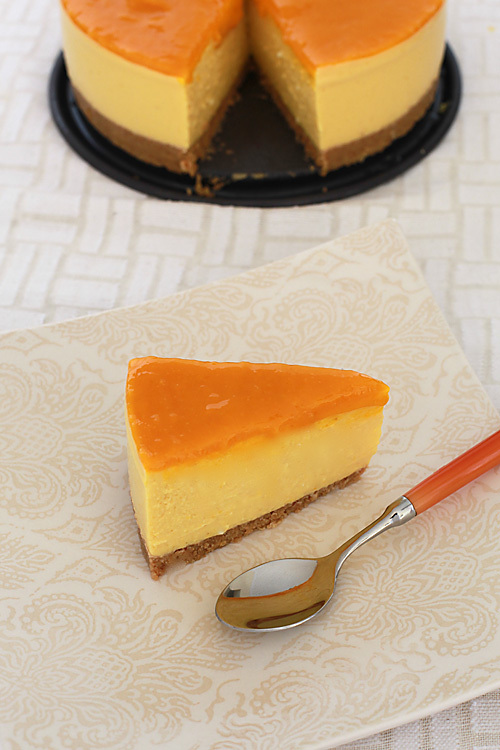 As much as I like a traditional shortcrust pastry for a pie, it is good to know a delicious crust made with readily available biscuits, cookies or crackers that easily comes together within a matter of minutes especially when there is a no-bake cheesecake such as this mango cheesecake involved. The salted buttery crust perfectly offsets the sweet and delicate filling. I was delivered the last crate of Alphonso mangoes for this season. And I had to make this cheese cake which had been on my mind ever since the mango season began before they completely vanished! There were a few requests from readers for a cheesecake with easily and locally available ingredients as cream cheese is not something that is widely available in India. It is not one of those ingredients easily available in your neighbourhood grocery section or store. I know of only a handful of places that stock cream cheese in Mumbai and I make sure that I replenish my stock as and when I visit them. Am I glad that I made this? You bet! This is going to be a constant fixture during every mango season in my home, a part of every celebration and maybe next year I’m going to welcome the mango season with this cheesecake just as I’m bidding adieu to this season with this incredibly wonderful vegetarian dessert. This is a cheesecake which is just about sweet. If you like your desserts sweeter then increase the sugar by about 1/4 cup. You might also have to do this if your mangoes are less sweeter. Use a deep dish 8” round springform pan or any pan with a removable bottom or a 9” regular round pan for this recipe. Try and use alphonso mangoes for this recipe. Place the yogurt in a cheesecloth lined colander over a container and allow to drain overnight to get half the quantity ( 400 gm or 1 1/2 cups) thick yogurt. Place all the biscuits in a sealed plastic bag (Zip loc) and with a rolling pin beat (does it sound violent?) until the biscuits are powdered. This is more easy than it sounds. Once this is done put the biscuits in a large mixing bowl. Put in the butter and with the help of a pastry blender or with your hands rub the butter into the biscuits until the mixture is well mixed. Alternatively, process the biscuits in a food processor until fine, drop in the butter and process again until the mixture is properly blended. Remove the mixture and press it evenly into the base of an 8” deep round springform pan or any pan with a removable bottom or a 9” regular round pan. Chill in the freezer for 15 minutes or in the refrigerator for half an hour. Break the china grass into small pieces and soak in 1 1/2 cups water for about 10 minutes until it becomes soft. In a food processor fitted with the metal blade or blender, place the strained yogurt, panir cheese or cottage cheese and the sugar and process until smooth and creamy. Transfer this to a mixing bowl, stir in the vanilla extract and mix well with a whisk. In a sauce pan, heat the mango puree over a medium flame. Do not allow this to boil. In another saucepan place the chinagrass and water mixture and stir on low heat until it melts completely. This can take about 10 minutes. Do not allow this to boil. After the chinagrass melts completely, pour the hot china grass solution into the hot mango puree, stirring all the while. Slowly add the mango mixture into the yogurt and cheese mixture and beat well with a wire whisk until well blended. Pour this mixture over the prepared crust, level with a spoon and chill in the refrigerator for about an hour. Allow the cheesecake to set for an hour or so before spreading the glaze over it. Place all the ingredients for the glaze in a saucepan and cook over medium heat. When it begins to boil, reduce the flame and cook for 3 to 4 minutes more. Allow to come to room temperature and then spread the glaze over the cheesecake with a spoon. Allow the glaze to set over the cheesecake for 2 to 3 hours or overnight, before slicing it. * If using cottage cheese make sure the water is completely drained and the cheese is dry to get a perfectly set cheesecake. Try and use panir cheese blended into a puree for this recipe. *A few notes about cooking with chinagrass or agar agar or kanten. China grass or Agar Agar or Kanten is a sea weed and completely vegetarian. It gives a smooth, glossy finish and many chefs prefer to use it over gelatin. China grass, if used properly sets easily at room temperature. 1. China grass needs to be broken into pieces and softened by soaking in water for atleast 5 minutes. 2. Heat chinagrass on a low flame for it to melt completely. 3. The dissolved chinagrass liquid should be immediately mixed with another portion of hot mixture. Remember that both the mixing agents need to be hot for the china grass to set properly. If either of them is cold, then the dessert wont set properly. 4. If the china grass solidifies before you add it into another mixture, then reheat until it melts completely and use as required. 5. If you find bits of china grass when you mix the china grass mixture into the hot mango mixture, then use an immersion blender and puree the mango mixture until it os smooth and without any lumps. Wowwwwwwwwww… Amazing recipe.. Looks soo tempting and delicious.. Wonderful clicks as usual.. have a gr8 weekend !! so this is without cream cheese? nice! Nags: Yes….without cream cheese since I wanted to make something with easily available ingredients. HI!!!! WATTA coincidence…. I made an eggless cheesecake mango yesterday and i stumble upon your blog today!!!!! amazing!! am i glad to see your perfectly formed cheesecake! !Doo u still live in Mumbai? I do and it would be great to befriend someone 'local'. Oh i could hug u..i love this am def gonna make this..thanks a whole lot!!! Great photo. I actually have agar agar. Thanks for sharing this wonderful recipe! Thanks a lot Anushruti, for this recipe! The cake looks wonderful!! Can't wait to try it! As i was really too eager to make cheesecake i made cream cheese at home n tried with your strawberry cheesecake recipe. It came out well n we loved it! But next time ill surely try this version! I wish the mango season would last much longer. awesome clicks as always.Such a treat.Wish I could taste that! Anu,where can I source Muscavado sugar in Bombay? Amazing, superb, awesome – just some of the things that come to mind, I am soooooooooooooo glad that you experimented and made such a wonderful creation. I will try and make it before the season ends too, if not next year for sure. Just one question does the hot mango & china grass mixture need to be hot or warm when you mix it with the paneer & yogurt mix ? Won't it separate or curdle if you mix hot with cold ? Well done for achieving it, big hug with a large pat on you back well done for juggling the blog and you lovely son. I'm so happy that you all are enjoying this creation of mine. Gauri: Great! You made cream cheese at home to make the strawberry cheesecake? Commendable!Yes…I wish too that the mango season lasted longer. Kiran: Thank you for your kind words. You could try using canned mango pulp too. Chinagrass sets very fast so you need to immediately mix the mango-chinagrass mixture with the creamy panir/yogurt mixture. It wont curdly since the panir and yogurt mixture is at room temperature and not cold. Good luck with the task you are working on. It is a droolworthy cheesecake and my eyes are still on those two mangoes.. I have added this Mango Cheese cake in 'What am I craving for' column in my blog. This is to feature the dishes I love with a link to the original post. This column will appear in home and individual pages. Please check out and let me know if you have any concerns. Your cheesecake sounds so delicious. Too bad the mango season's over. Shilpa: You can get muscovado sugar in Hypercity. You could also try using the jaggery powder available in organic stores as a subsititute. I made Mango Cheesecake by modifying your strawberry cheesecake recipe. Except that i made the cream cheese at home. Apparently your version requires lesser effort! So next time when the Mango season arrives I'll surely try this first!! Gauri: You could use canned mango pulp if you want to make this when mangoes are not in season. I usually don't like non-baked cheesecakes, but this looks delicious, Anu! Maybe I'll try this using aamras! Oh yes.. Then I can try it soon. Thanks for the tip! I am here for the first time and I am totally smitten by your work on this blog. Few reasons why I consider coming back here 1. blog being vegetarian 2. awesome collection of recipes which I loved 3. amazing photography to woo me back here!!! Thank you everybody for your wonderful words. I'm glad you all enjoyed this. Wow…this looks good…a cheesecake made with paneer and it looks so creamy… simply amazing. btw,i have been toying with the idea of using china grass… your post gives me a fair understanding on how to use it, so I am going to try it. This cheesecake brings so much joy to my eyes (and a lot of rumbling in my tummy) I wish i could reach out and grab that slice.I hope you won't mind,I'd love to guide Foodista readers to this post.Just add the mango widget to the end of this post and it's all set, Thanks! I must say thankyou soo much for posting up this amazing recipe.. I am in Delhi and was desperatly looking to make a cheese cake without cream cheese.. i used to make this back home in Australia however the cost of cream cheese here (philly) is crazy for the amout you need.. may as well go buy a full cake somewhere.. I just finished making it… lucky for me i had 10kg of mangos in the freezer from mango season!! It looks amazing.. actually looks like the photo on here… only thing is i had the same issue as devi108.. seems alot softer than is expected.. not sure why exactly, any ideas? i used proper china grass and everything just not sure if the yogurt is full cream.. just says dahi.. maybe i cut it too soon or the fridge is not chilling it enough… i am going to test again tomorrow morning if not am going to make it again… thanks again! if it works i am going to try blueberry or something different! rogindia: 10 Kg of Mango Puree? Great! If you thoroughly drain your yogurt and use 10 gm of chinagrass (Please weigh it, I had to use 1 1/2 packet of chinagrass to get exactly 10gm, the packets here sometimes dont actually carry the said 10 gm) I dont see any reason why you shouldnt get a properly set cheesecake. Let me know if you happen to try other flavours. Thanks for the reply and info.. Excellent I am draining the yoghurt for another one.. can't wait! actually 20kg of mangos i brought before the season ended.. cleaned and baged about 10kg of actual mango! Just ready for the cheesecake! I thought it also could be because i am using fresh panir.. is there a draining method for that? I will get back to you with results tomorrow! rogindia: You could drain the water from the panir by keeping it over a colander for a few minutes. Hope your cheesecake sets well. Goodluck! oh my goodness, this indeed look like the best home made cheesecake i have seen. it looks moist, looks cheesy and mangoey delicious. and i always made cheesecakes without gelatin, great to know a recipe from agar agar. thanks! method for agar agar powder? Tamanna: Chinagrass and Agar Agar are the same. Be sure to measure the agar agar accurately to get a perfectly set cheesecake. You have to melt the agar agar on a low flame until it dissolves completely and the solution is clear. And then strain it( by holding a sieve or strainer) into the warmed mango mixture. All the best. Hope you get a great cheesecake. thanks Anushruti. i have placed the cake in my fridge now. But now i have another question, how liquid was your cake mix? since cottage cheese bought from store here is more liquidy, i was not sure what to expect. i set my agar agar correctly. hoping for best. Tamanna: You have to use completely drained cottage cheese. the one I used was firm and had no water. A few have tried this recipe and the cheesecake didnt set properly as in the picture above. I figured out the culprit. Its the water in the cottage cheese. Make sure to completely drain the cottage cheese of all water by using the same method as the yogurt mentioned above. If you want to avoid this, its best to use panir cheese. Tamanna: I love your positive attitude. Now that we have figured out the culprit, there can be no reason you will not get a perfect cheesecake the next time you try it. I just tried making your cheesecake! I have to say, beginner's luck doesn't seem to apply to me, because I seem to have run into several snags! 🙁 I hope you can help me, because your cheesecake looks lovely, and I'd like to make one like it someday! Secondly, my mix at the end was quite liquid. You said to smooth the top over with a spoon, but I didn't have to at all! The agar-agar and mango pulp were all measured correctly. I seem to have done something strange, but I can't figure it out. And the end result was a little lumpy, probably because of the paneer? It's in the fridge now, so I'm still keeping my fingers crossed. 🙂 If you can see any glaring mistakes I've made as a rank beginner, I do hope you can help me! I'm totally keen to make this again, properly! I'll let you know how it turned out in the end, but for now, I'm a little apprehensive! Amrita: Did you use frozen paneer? If your paneer pieces were hard then you need to soften it by soaking in some hot or lukewarm water depending on how hard they are. Its best to use fresh soft paneer which will blend easily and have no lumps. You need to have a smooth mixture of the paneer and yogurt for the cake to set well. You can use a little water to blend it into a very smooth paste if your paneer is hard and doesnt blend well even after soaking in water. I'm not sure what you did to make your mixture liquid. Did you measure out the ingredients accurately? If you did then there is no reason this should happen. A tip, please measure out your ingredients in metric for more accuracy. And yes, it could have been the paneer which caused the lumps since it was not blended into a smooth paste. I do hope you give this a try once again and get a great cheesecake. I'm glad to help you out if you have more questions. All the best. thank u 4 ur ez cheesecake recipe. its a gr8 help. i wud like 2 kno how much is 10 gms of china grass? 1 or 2 or 3 tbsp? or how much? also, d cream cheese can b bought from the stores n it wil still giv d same delicious result? how does 1 make cream cheese at home? many questions but i m sure u wil reply dem. gauri, u can tell me how 2 make cream cheese 8 home? Mrs. Sayed: It is better if you weigh the chinagrass to exactly 10 gm for accurate results. It would approximately be 10 tbsp. I have not used cream cheese in this recipe. You can refer to my strawberry cheesecake if you want a cheesecake recipe with cream cheese. Hope this helps. I will be glad to help you out if you have more questions. Wow, I tried this and it was really amazing as I tried to make a cheesecake for the first time and it came out just like a professional would have made it. Thanks Anushruti, hope to get even more delicious recipes in the future. sassubai: Thanks for reporting your success and I'm glad you could make this to perfection. Will try my best to keep giving wonderful recipes. This is a great recipe. I tried it out and it looks just like the picture and tastes divine. Enjoyed every bite of it. Kids were very happy to finally have a vegetarian cheese cake as well. Thanks for the recipe. Keep up the great work.Love your website for your pure vegetarian recipes. i tried ur mango cheesecake it really tasted divine. my niece has a sweet tooth. she loves ur cake recipes. she wants to make oreo cheesecake. pls i will be greatful if u can give me the recipe.thanks a lot. Thank you for the yummy recipe. a bit not upto the mark. What could be the error? How can I correct, as I would like to try one more time making this. Although the taste was so yummy!!! Thanks once again! Vidya: I'm so happy that you could replicate this EXACTLY and thanks a ton for reverting and telling me how your cheesecake turned out. Priya: If you like this so much, hope you will make it soon and tell me how it was! Sangita: Wow..great that this worked for you as well…will try and put up an oreo cheesecake recipe for you. Too many recipe requests are pending so I hope you will be patient. Thanks. latha: It's very difficult for me to say what went wrong wihtout you giving me any detail. All I can say is if you measure correctly, use the right ingredients and steps there is no reason why you wont get a nice cheesecake just like the others who have tried this and had success with it. I came across your site on Indiblogger. 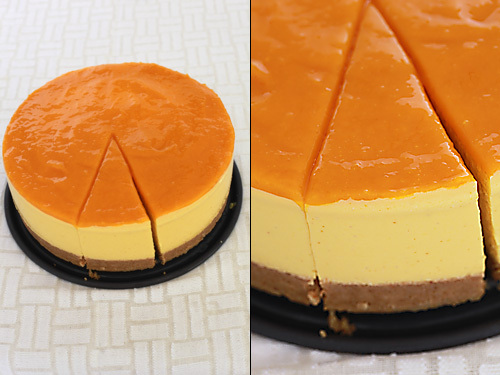 The first post I opened is your Mango cheese cake and it looks heavenly. I want to try it this season though it looks very complicated. I thought I'd try out this recipe but here in Bangalore I only got what is called Instant China grass…and because I wasn't sure of the proportion of that to use, it didn't set for me. I used the proportions indicated on the packet, to arrive at the amount for 1 and a half cups of water. It actually sets as is (I set aside a spoon and it set quickly), but something went wrong when I mixed it into the puree. I think my yoghurt + paneer consistency was right. I'll try and look for the solid one next time. For now, I have frozen the cake and am serving as a kulfi! Such: I have never tried this recipe with instant chinagrass. You might need to use lots of it, I can't really say how much until I actually test it out. Chinagrass is usually available in grocery(kirana) stores. I have seen it in departmental stores or in malls. Thanks very much for a creamcheese-less recipe! I tried it out (with gelating, since I couldn't find agar agar)for my mum's birthday, and it turned out really well! P.S. I'm reproducing the recipe on my blog, with a link here. Let me know if that's a problem. I tried the mango cheesecake and it came out good. The texture and the taste was very good. Only problem I had was it became a little liquidy if kept out for a long time. Dose this happen because of heat, as it is very hot right now here. WOW !!!!! is jus the word this mago cheese looks awesome…m gonna try this out for this Saturday ..is yummylicious..wish i cud jus grab a pc rite away..mouth watering…will let ye kno the outcome of this cake….& thanks for sharin suc wonderful easy recipes ..God Bless U dear..
Sandhya: It is best that these cheesecakes are not left for too long in warm and humid conditions and refrigerated when you are not going to immediately eat it. Rubeena: The taste and texture of the cheesecake would change if you use other ingredients. If you use fresh yogurt this won't taste sour at all. Infact one may not even find out that there is yogurt in it. I did not get the ideal set, and am not able to figure out why the china grass was not doing its job! I hope it is not anything to do with brand of the china grass I used. I made it thrice and my father just loved the taste, others liked it too even if it had not set properly! Meenu: Are you weighing the chinagrass properly? I need 1 1/2 packs of chinagrass to get 10 gm sometimes. The quality also differs. Which newspaper? Am curious! My first visit to your blog. Extrememly motivating. These cakes look absolutely gorgeous. i could only hope that they possibly come out of the picture and I can take a dig with my sweet tooth. I made this wonderful cake and those who had it had nothing but praise for it. I have also posted it (the one I made)on my blog with your website and many thanks for the same. Sandhya: So glad you and your family enjoyed it. And thanks for the feedback! I was wondering if i can use panir cheese and yogurt for making the chocolate cheesecake as well. Saini: You could try but I can't give you the exact details since I havent tested it in my kitchen! If you happen to try let me know how it went! OMG, You are a STAR! I just found you yesterday and I´m in love with your work already! I just made this cake for my non-veggie friends today and they couldnt believe it was home-made AND vegetarian. Made it with canned kesar-mango pulp, as fresh mangoes arent readily available this side of the world, so I added no vanilla. I also used agar-agar powder (12 grs in a sachet), and coconut flavoured yoghurt (thats what I had at home saturday night) and I made the fresh paneer at home. Came out perfect in texture, flavour, weight, and colour. Hubby loved it too. ABSOLUTELY DIVINE! Will surely make use of this recipe again. The only weird thing is that the measurements must be somewhere off, as I ended up with too much filling… enough for 1 1/2 cakes, so I poured the extra into a half sized dish, covered it with some extra glaze and kept it in the fridge to enjoy without the crust, as I hadnt prepared more of that. What´s your cup measurement? I use the american standard cup, 225 grs, and that gave me excess filling. Not that its gonna get wasted, but just wondering. Nirmal: Thank you for your nice words! A standard American cup is 240 ml (237 to be precise!) and I use a standard 250 ml cup! You can look for more details in the "measurements and conversions" section of divinetaste! As stated above I used a very deep dish 8" pan and it was full to the brim! you can use a 9" pan to accommodate all the filling. Hope this helps! I love your blog. I can't wait to try the Mangocheese Cake recipe. I have the agar agar flakes and not sure how many tbsp to use. Please let me know if I have to weigh the flakes to 10 gms. If you are using Agar or a vegetable based gelatin you may have problems with this setting. This is because the enzymes in certain fruits (mangoes, paypaya, pineapple, peaches) break down the setting capabilities of the Agar. You have to cook the fruit first to kill the enzymes. M Mercer: Yes you are right. I have used agar agar here and cooked the fruit. And as you can see the cake set beautifully! Hey – since most seasonal fruit available now cannot be used in cheesecake – can u tell me if i can use this to make either lemon or chocolate cheesecake – and how much i should use? Priya: I have not tried making lemon or chocolate cheesecake with this recipe. Try using tinned mango puree which works great! I was looking for a cheese cake recipe and this is the perfect one. A question I have is if I were to use mango or strawberry puree would the measurements for the filling and the glaze be the same or would I have to adjust that for consistency? I'm an amateur cook so I'm not really sure how purees work as a substitute to the actual thing. Melissa: yes, the measurements would be the same. All the best! The recipient looks awesome! Can I use tinned mango pulp since I don't get Alphonso mangoes here? Dhanni: Yes…you can use tinned mango pulp! instead of pureeing the mango, can i just add sliced mango to the top? jo: You need the pureed mango for the texture of this cheesecake. You can also add sliced mango over the top if you wish. Wow! !Just made this mango cheesecake for the first time and it came out sooooooo delicious! !Congrats Anushruti for your great recipes…hope you keep posting such mouthwatering desserts for us..Thank you!! Laxmi: So happy about your success! Hi Anushruti… been following Divine Taste for quite sometime now, because there're not many websites which offer fail-proof and crystal-clear recipes, like yours, for novices. And oh, by recipes I mean pure veg. recipes and not the Egg-OK-Gelatin-OK ones! This might sound a bit silly, but as I said I am a novice in these things! Nalini: Thank you for your kind words. Don't worry no question is silly. It is better to use a springform pan or a pan with a removable base to retain the shape of the cake. And no, inverting this is a strict no! Hope this helps. Rohini: Thank you for the compliments. Yes..please weigh your chinagrass the next time. From what you are saying, I gather that you have used less quantity of chinagrass and that's why your cake didnt set as it should have. Please cook the glaze well for it to set properly. You can even use a little china grass solution mixed into the glaze to get a super perfect glaze. Shortening is made out of hydrogenated vegetable fats and is also known as margarine. You can use butter instead. I almost always do and never use shortening in my recipes. Hi. I just stumbled upon this wonderful looking recipe while surfing for a no bake Mango Cheesecake. Can't wait to get started! A quick question- if I want to substitute the chinagrass with gelatin, how much quantity of the gelatin should I be using? Thanks! Pooja: I use only vegetarian ingredients in my cooking and gelatine is non vegetarian. I'm sorry I can't be of help! Wow , this recipe looks exciting and I am going to try it tomorrow . I hope I get the results like yours . I actually have a mango cheese cake receipe with fresh cream ( Philadelphia Cream ) and its so expensive to make that cake that once cannot think of making it often . I actually read all 95 comments you have received so that I could take the necessary tips to ensure my cake comes out like yours . Wish me luck .Just one question – When u say use 2 mangoes ( one cup ) that means the puree that I get from 2 mangoes should be 1 Cup ( approx 240 ml ) right . hi anu ,this recipe looks sooooooo mouth watering . i got to try this . i read all 95 comments because i want to know what problem people r gettin.i would like to know how to make yogurt at home if u have the recipe.thank u for all the wonderful recipes. simone: Its better to use store bought yogurt for desserts as it is has a good consistency. To make homemade yogurt take 2 cups of milk and heat it until warm. Your little finger should be able to bear the heat for ateast 30 seconds. Stir in 2 tbsp of yogurt into this, mix well and allow to set. This requires a little trial and error. If the yogurt starter is very sour you need to use less. Hi Anu ,thanks for ur advise on the yogurt.i would love to make this mango cheese cake for my daughter Namrata`s birthday but i cannot find china grass ,i get agar agar powder ,can u give me a little more on how to use the agar agar powder is the first time i am going to make a cheese cake and the first time to use agar agar powder which is very highly priced i want the cake to come out perfect. Veena: You can use 15 gm chinagrass the next time. The water content in yogurt varies and the difference in 100 gm could also have led to this difference in texture. simone: agar agar powder is non different from chinagrass. Use 15 gm to get a perfectly set cheesecake. Hi Anushruti. Just making the cheese cake for a lunch today. Wanted to clarify that we dont need to add any gelatine or china grass to the mango glaze for it to set, does it set without gelatine? Love all the recipes you make Anushruti. I made my mango cheesecake with gelatin and it turned out well. Shilpa: 🙂 Great! Thanks for the feedback! nina: Firstly, this is not a mousse but a cheesecake. You need to use china grass flakes or powder. I'm not sure if bluebird flavoured powder works as I have not tried using it. Try using china grass the next time. If your mangoes are sweet then you won't find the glaze sour. Hope you get better results the next time. monica: Sorry for the delay. I don't use chinagrass for the glaze as I like mine this way. You can use if you want a very firm set. hi.. very nice recipe.. and thanks for it.. just a question, here in Delhi I got powdered flavoured china grass.. can the cheesecake made with that? please reply!!! This was with gelatin. It looked great when I took it out from the mould, but after about an hour, it crashed under its own weight. Though it tastes good, I was so disappointed. Thought I'd check out other recipes and came across yours. You have mentioned 10 gms (10 tbsp)of Agar Agar. Should it read 2 tbsp? Pl clarify. With 1 1/2 cup of hung curd and 2 cups of paneer, will it not be too heavy to hold itself on a biscuit base? Any idea why mine could have crashed? Vrinda: I don't know what recipe you used to make the cheesecake and so I can't comment on why your cake crashed. I'm an absolute beginner at cooking, let alone desserts, and have been trying to learn to make a good cheesecake. I struggled a bit because of the fancy ingredients used in other recipes that are very hard to find and expensive in Delhi. Your recipe seems great for that reason, andalso the fact that it looks brilliant! Before I gave it a shot I wanted to clarify, is thick full cream yogurt the usual dahi that one gets from the dairy? If so, what would you suggest for this recipe- fresh dahi or packaged? Also, is paneer cheese/ cottage cheese the usual fresh paneer that one gets from any regular dairy? Kritika: It's better to use thick and creamy store bought yogurt for a good consistency. If you have a dairy which gives you really thick yogurt that is fine too. Yes use fresh paneer from your local dairy. I'll be happy to help if you have more questions. I just tried your recipe and it's still in the fridge, but it seemed very runny and I have a feeling it's not going to set. My question regarding the china grass is what Vrinda says above: You have mentioned 10 gms (10 tablespoons)of Agar Agar. But in a comment to Mrs Sayed above you've said 6 1/2 tablespoons? Could you please clarify the amount? Vidya: 1 gm of chinagrass is 1 tbsp. I have updated this recipe. If you want a soft set cheesecake (by soft set I mean set but quivery) use 10 gm or 10 tbsp or 1 pack of chinagrass and for a firm set use 15 gm, 15 tbsp or 1 1/2 pack of chinagrass. Vrinda's question was relating to the use of 10 tbsp agar agar. You can't do a direct weight by weight replacement of agar agar and gelatine. They are dfferent and different measures have to be used for each in a recipe. Anu many thanks for your response. The recipe on Tata Sky mentioned 2 tbsp of gelatine. In the demo, some of the gelatine was used for the glazing hence I used 1.5 tbsp for the cheese cake and 1/2 tbsp for the glazing. The recipe did not mention that an extra quantity of gelatine is to be used for the glazing! The probable reason for the tasty disaster. Anyways, I will try your recipe(with 15tbsp of agar agar). Allow to come to room temperature and then spread the glaze over the cheesecake with a spoon. Allow the glaze to set over the cheesecake for 2 to 3 hours or more before slicing it. Allow the cheesecake to set for an hour or so before spreading the glaze over it. do we need to keep the cheesecake in the fridge for 4 hours, then spread the glaze and allow to set it for 3 hours? Or take the cheesecake out of the fridge, allow to set in room temp for an hour and then spread the glaze and aloow to set for 3 hours? i like your dessert its really yummy!!!!!!! If I use the instant Chinagrass that is the Bluebird variety, how would this measurement translate? Just saw my question has already been answered earlier. Thanx!! Googled and saw this site. The website name itself was inviting enough. Was too lazy to keep the yoghurt overnight, so the first time I mixed paneer with yoghurt and used the blender, it was thin as water. Tried again, this time minimizing the usage of blender and the mixture was just thick, but not as smooth as I would have liked. Now that the three layers are done and in the refrigerator, am crossing my fingers (will be restless for the next 2-3 hrs). Its' 7:00 and I have told wifey that there is no need to order dessert for the dinner tonight. Am just hoping that the cheesecake turns out to be edible and I in turn get lucky !! hi ,i have powdered china grass,do u think it will work? and also ,can i use cued instead of yogurt? Firstly i want to thank you for the wonderful recipes you have on your blog. i tired most of them as your food is without onion garlic and they turn out to be perfect each time i make them. I came to know your blog from Kurma Dasa prabhu's website. He mentioned about your Komala kheer recipe. I made it and it turned out to be amazing. I am gonna make that again for srila Prabhupada Vyas puja (offerings) which is coming on Aug 12th. Thank you so much for that wonderful & precious recipe. I want to make this recipe over the weekend. i havent tired the cheese cake recipe till now. this is teh first time i am gonna make it. please can you clarify few things. i have got agar agar powder form heath shop over here. i have never used agar agar. 1) i have read somewhere that to set 1 tbsp of agar agar we need 4 tbsp of water so that means for 15tbsp of agar agar i will need 15X4 Tbsp of water. will this not make the consistency of the filling liquidish or pouring consistency. Also you have not mentioned anywhere in the recipe how much water to use to boil the agar agar or china grass if i am not mistaken. Can you please help me with this. rimi: Yes powdered chinagrass will work as well. You can use curd but it is better to use store bought yogurt here as it is very thick and creamy and just right for this amazing dessert! Ambika: Please read the recipe carefully. The amount of water to be used is mentioned in it. All the very best with it. Hi Anushruti, I reside in U.S and wanted to know if I can use canned Alphonso mango pulp and cream cheese? If so how much? Miinie: Yes you can use canned mango pulp and replace it with the fresh mango puree. I havent tried replacing this particular recipe with cream cheese. But you could substitute that as well using the same quantity for the drained yogurt as given in the recipe. excellent recipes..all of them come out as shown.thanks for sharing. I was reading the comments (got throught the first 50 or so)and I thought maybe some of the mixtures are watery/runny/liquidy because they are adding too much water to the agar-agar?? How much should one add exactly? I have tried many of your recipes and I must say that they have all come out really wonderful, if I do say so myself. I have a query with this recipe, since its not the mango season and I rather use fresh fruits, can I use any other fruit? Perhaps blueberry or strawberry(though you have shared your strawberry cheesecake recipe, could I do it this way?) Any other fruit suggestion? Just a clarification(its very very silly), if I can use other fruits, 1 cup, and half cup of the pureed fruit should be used for the filling and glaze respectively, right? Also, should I add water while pureeing? and should I strain it as well to avoid fiber and lumps? Thanks a ton for this wonderful recipe and for your time in clarifying my doubts. Akshara: /this tastes best with mangoes and you can use canned mango pulp too. I havent tried making this with other fruits but berries like blueberries or strawberries should work well. Don't add water while pureeing or strain as the berries are soft fruits and you should use only such fruits for this cake. Oops! Just saw the previous post & your reply! Sorry…..got my answer! Pooja: I havent tried doing so. I already have a separate strawberry cheesecake recipe. You might want to look at it. Let me know if you try doing the mango cheesecake with strawberries. It might work! Have a doubt pls pardon my ignorance is it 10 tbsp of agar agar? Great recipe!! 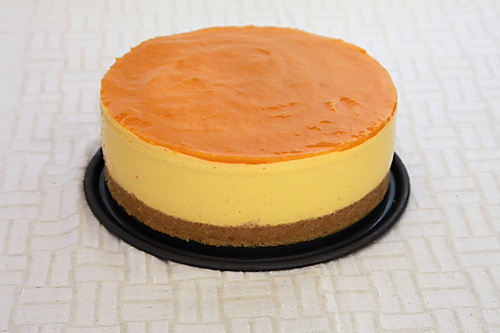 This mango cheesecake sounds absolutely delicious. I'm going to give it a try. Can the yogurt be replaced with fresh cream? The weather is extremely hot here and if i hang the yogurt it gets very sour. Will that affect the taste of the cheesecake? I want to retain the mango's sourness but will adding yogurt make it more sour? Divine Taste… most certainly. The recipe was brilliant. I will make this when I have company next time. Thanks. I made the mango cheesecake today… since I did not have adequate paneer and had excess yogurt, changed the ratios slightly ( 260 gms paneer and 550 gms hung yogurt) keeping everything else constant… I'm happy to tell you that the cake was a success!! Thank you for the fantastic recipe, its a keeper!! I shall be trying it with chocolate next, will let you know how it goes. Mmmmm Anushruti…it looks soo delicious…I am planning to make one…but I have a doubt..can we just use drained yogurt only instead of the paneer?and how much shall we use? Hi Anushruti…the cheesecake looks great! Where do you buy Agar Agar from in Mumbai? Thanks! Can I use this recipe to make strawberry cheesecake? Or does this apply only to mango because of the slightly sour flavour of curd/paneer? Ramya: Yes you can!I havent tried it with this recipe. But I have a another strawberry cheesecake recipe on the site. I tried out the cheesecake. There was no problem wit the cheese cake or glaze part. It came out perfect. But after taking out the cheesecake from the fridge and unmoulding I tried to cut out a slice. But the crust was so hard that it became impossible to cut it at all. Wat do you think went wrong? May be I pressed down too hard or was something wrong with the biscuits. Help? Arthi: Maybe you used less fat? Or overfroze it? can i use veg gelatin instead of agar agar? i culdnt find agar agar at arief. what is the quantity of veg gelatin i sholud use for this cake. It's mango season will surely try this recipe. For one it looks gorgeous n it's such a healthy recipe. But just 1 thing u have mentioned 10gm agar agar (10tbsp) I guess it shud be 1tbsp right ? I cant find agar agar/ china grass anywhere. I stay in mumbai. Can u tell me where it is found…. I have a hypercity right next door but they dont seem to have it either. Can i get it online somewhere…. please oh please help!!!!! Hi your recipe looks very interesting.I want to try it,can you please tell me if i can use milkmaid instead of yogurt.I have a confusion for China grass…if i am using Blue bird brand they have different varieties, which one should i use. Pallavi: You cant substitute the yogurt with milkmaid here. You have to use a plain variety of china grass which is not flavoured. It is better if you get those sheets of china grass that come in 8 to 10 gm packs. renu: Look for it in local grocery stores or kirana stores. You will find it for sure. Hi Anushruti, so happy to come across your recipe….just one small query…after the mixture has been refrigerated for two _ three hours, do we need to wait for more before we put the glaze? Or just continue with the glaze soon after and refrigerate for further three or more hours? seena: Agar Agar is very neutral tasting, has no flavour of its own and sets a pudding very well. Sangeeta: As mentioned in the recipe, allow the cheesecake to set for an hour before spreading the glaze over it. hi,first of all thanks for the recipe….i want to try dis but have some queries though i read all ur comments but want to clarify myself. how come 15gms agar agar powder comes to 15tablespoon bcoz any other thing we measure 10gms comes to 1 tablespoon(coffee powder or hing).so is it a type error or agar agar powder is so light that it measures 1gm = 1tbsp i want to really know the spoon measurements.Thanks in advance. sangita: If there was a type error so many people wouldnt have got this right! Right? Agar agar has a very light texture. But if there are specific instructions on the package, then go accordingly! But my cake texture was loose.and secondly can I use fresh cream too in this cake. Nazima- they are the same. I love your recipes. They are so sattvik. Amazing Photography and writing. I have tried a few of your recipes and they have always turned out good. 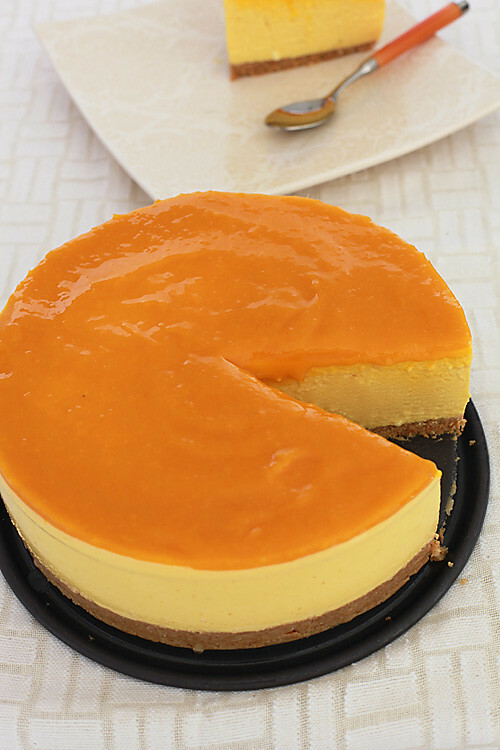 I would love to try this Mango cheesecake. We easily get sour cream here in the US. So i was thinking can i substitute the thick yogurt with sour cream. Please advise. Sitapriya- I don't think sourcream would work here in this recipe as it was tested with yogurt. You could use Greek Yogurt. Am glad you enjoy my recipes. Please can you tell me if I can use mascarpone cheese instead of cream cheese? Nerali- I havent tested this recipe with mascarpone so I couldnt say for sure, since this recipe does not use cream cheese as well. Otherwise you can substitute it. Have you used agar agar powder or agar agar flakes? ritu: agar agar sheets made into a powder. I had tried this recipe last year but i screwed up because of agar agar. i went through all the comments also to know have to mentioned about where agar agar will be available in mumbai. Can you pls tell where i can buy agar agar. I again want to try this recipe. This is Pushpa, long time follower, frequent visitor to your space, commenting for the 1st time here. First of all, you have a wonderful blog, your love for food and cooking really shows. I like the fact that all recipes are no onion-no garlic. I am not a strict no onion no garlic person. But like to avoid it during festivals or whenever run out of it ;-). I am huge fan of mango and like you have mentioned in another recipe its best to eat mangoes as is. Though the shots of this recipe are so captivating, I am not a huge fan of yoghurt+mango combo (dont like aamrakhand too) so was holding out from trying, but it was hubby's b'day and he is a aamrakhand fan so decided to give this a try. I tweaked the quantity of agar agar and it is holding good, so thought of updating. Quantity for all the ingredients is same except agar agar. Full fat yoghurt and cottage cheese (horizon brand 4% fat) were store bought. Hung both in separate cheese cloth overnight. Mixed them together in food processor. This mixture was very thick almost like whipped cream consistency. Used 5 TBSP agar agar flakes (Eden Brand from whole foods). Rest everything is same as you mentioned. Next time might try reducing even further since the texture was pretty stiff already. Thought folks in US might find this bit helpful. Thanks Anushruti for the amazing recipes. Sorry the comment turned out pretty long..
Rupali: You have to look for agar agar flakes in general stores also known as kirana stores. Ask around and you will find out a shop selling the same. All the best with the recipe. Pushpa: Thank you for taking the time and giving your inputs. Really appreciate your gesture. Look forward to hearing more from you. Made this mango cheese cake. I used one packet of agar agar powder which we get in singapore. its 10 gms. I used cream cheese. came out perfectly. Thank you very much for the recipe. I hope you will show this recipe in your videos. Rupa: Seems like the universe will cater to your wish soon. Just finished filming the "Mango Cheesecake" episode for "Divine Taste With Anushruti". I be just made your yummy looking cheesecake and put it in the fridge to set .we re having people over for dinner . I want to clarify the amount of China grass one needs to add . 10gms seems to less and I think my mousse will not set !!!. Will mail again after a couple of hours when it s supposed to have set . please keep fingers crossed !!!! Hi there. I tried this cake for my husband's birthday today. It came out really good. Thank you sooooo much for the recipe.Going to try more recipes from the site! Dear guruji, guruji for all vegetarian recipes .saw your demo on video,very much attracted to it. Not only me, but many others. So, one question:-Can beginners do half the quantity specified by reducing All the ingredients to half? So, what will happen to the time, wherever it is specified? Of course using a4" spring pan or loose bottomed one. Barkha: Awesome! Look forward to hearing more from you. Just wanted to ask that can I use bluebird vanilla flavoured instant china grass because in Jaipur I can't find the flakes. And also if I use the instant China grass should I follow the instructions on the packet or please suggest how should I use it? nandini- I havent tried this recipe using instant chinagrass packs. China grass bars also known as agar agar should be available in grocery stores or kiranas. The muslims use it a lot. Try looking for it in an area they live in. wani- yes you will have to halve the quantity of agar agar or else the cheesecake will be too stiff. I am just going to try ur recipe of strawberry cheesecake so can u pls tell me what can i use for the substitute of thick yoghurt and hung yoghurt. I have excess amount of cream cheese so if i can use tht for substitute then pls specify the quantity.THANKS!MERRY CHRISTMAS! Ishita- You can substitute the paneer with the cream cheese. The hung yogurt in this recipe cannot be replaced. Cheese cake is one of the best dishes to treat your sweet tooth with! Awesome post, I must say! The simple and easy to understand recipes along with the descriptive pictures of this dish will make your readers drool over it! For sure, soon I'm going to make this for my family! I had also tried online cheesecake delivered by iChef, really delicious cake, one must definitely try. I searched for agar agar / China grass a lot, could not find it. Can I substitute agar agar for jell-o? This one is vanilla flavoured and has carrageenan and corn starch as thickening agents? I wanted to know if I can jell-o instead of agar agar? jayalakshmi-I havent tested this recipe with jell o and I cant vouch for it. Depending on where you live, try looking for chinagrass in health food and speciality stores. If you are in India, lot of kirana shops have it. Good luck! i ve tried your cakes they turn out yummy and perfect. just one question with this recipe of mango glaze can i substitute mango with chocolate and make chocolate glaze. or is there any other way of chocolate glaze. richa- Yes you can make a chocolate glaze to top this cake. how do i make chocolate glaze.do i use melted chocolate or is there any other method to make it. You can melt the chocolate, cool slightly and use it as required. Himani- Thanks you. Havent tried this recipe with peaches, so I cant give you the details. I do hae a lovely peach cake recipe. You might want to check it out. Will make a note of the recipes you want. All the best! I have been following your recipes(in YouTube) for a short while. I love your kitchen presentation, the recipes and I eagerly wait every Wednesday for your new dishes. I had tried your basic eggless cake recipe in pressure cooker and it came out successful. 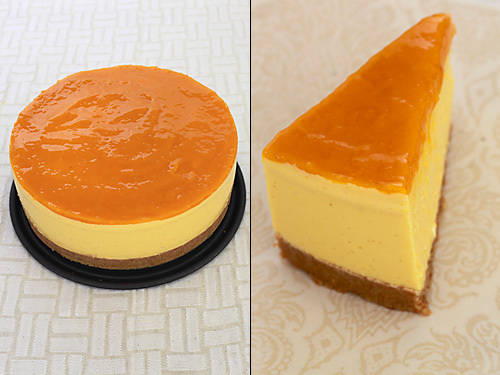 After seeing this mango cheese cake I can't wait to try them out. Thank you so much for your recipes. Hi Anu, just to check if I can use the same recipe with cream cheese instead of paneer? My husband don't prefer paneer so, I'm checking on other alternatives. If can, what's the measurement like? Rupa- you won't be able to detect the presence of paneer in this recipe. You can try with cream cheese, the texture may vary a little though. Vikas- Thank you for the note. Look forward to hearing more from you. Shrutee- Your cheesecake was not set. Are you sure you melted your chinagrass properly? There is no specific brand for china grass. I use whatever is available. Hi Anushruti…i tried this mango cheesecake today…n it was a big hit…..but i felt it bit less sweet for our taste buds…..so as u said we can increase sugar….so if i increase the sugar by more 1/4 cup….so can i also increase the amount of mango puree….like can i add add half cup of more mango puree….total one n half cup mango puree…..? ?n offcoarse keeping all other measurements same….n i also had some problem of glaze…as it started to drip from sides n didnt set properly….i had set the top mango glaze for three hrs….can can we add little china grass n make the glaze n then pour it…so that the mango glaze holds its shape….? ?any suggestions…. Just chanced on your eggless mango cheesecake recipe on YouTube. It came out really well and since then I have been reading up your recipes on twitter, this blog, and youtube. Really impressed with your recipes esp the sattvic ones. Nimisha- Yes you can increase the sugar alone. There is no need to increase any other ingredients. And you can add china grass to mango glaze as well. Anita- Thank you for your feedback. Look forward to hearing more from you. I made the cake with paneer and hung curd. Added the agar agar. Either the cake is too watery or too thick like the China grass moulds. It doesn’t give the exact consistency. Where am i going wrong.? But the taste is awesome. I made a paste of hung curd , paneer, sugar and cream into fine paste. Added mango pulp and mixed the mixture. Prepared agar agar solution and mixed it.poured in on top of the biscuit layer and kept in refrigerator. Please guide as to where am I going wrong. Tasneem- Please follow the recipe accurately. You need to mix the agar agar solution with the mango pulp before mixing into the cheese-yogurt mixture. I absolutely love your recipes and have tried many of your recipes and till date almost all have come out really good. But now I need your help as I made this mango cheesecake yesterday and that still didn't set. My husband and my in-laws were waiting for this cheesecake and I'm feeling so bad for my cake didn't set. Please help me out to fix this asap. PS: I have used 8" spring form pan and even poured the cheesecake mixture in 2-3 wide mouth glasses. I've checked in the glasses if it is set. The pan is not disturbed. Prerna- This cheesecake can be set by handling agar agar in the correct manner. Please read the recipe carefully and use agar agar properly to set the cheesecake. I tried this and it worked out to be amazing!! thank you for such a lovely recpie. Diksha: Great to hear this! Thank you for the feedback! Richa- Yes, you can substitute. Lovely recipe! I had a query. I was planning to make this on my mom's birthday. But due to certain circumstances I'll have to make it two days prior to her birthday. So wanted to know if this can be refrigerated for two days and then cut? Thanks! Aisha- 2 days should be fine. Ideally I would recommend not more than a day! Yes, you can do that! You can use buttercream or cream icing and with the help of a nozzle, write your message.